CIDER LEAN Scott Heath and Ellen Cavalli in front of the namesake tilted shed, while son Benny gets silly with the sheep. In the George H. W. Bush era, on the banks of the Russian River, a small cluster of apple trees was abandoned—blackberry vines crawled over the property, and the small orchard disappeared. Crop after crop of fruit fell aground in the timeless, ancient way of trees, while the world raced forward through the Clinton years, the craft beer boom and the internet age. Then, in August of 2011, a pair of snipping blades parted the brambles, and two Sebastopol residents stepped into this long-lost secret garden, bringing to an end its age of isolation. They were Scott Heath and Ellen Cavalli, aspiring farmers and fermenters hinging their future on the cider business. The quest for fruit, plus a helpful tip from a landowner, had brought them searching in this overgrown jungle, which had been planted with heirloom apple trees, then abandoned, in a failed cider endeavor at least 20 years ago. "It's nice to know that someone else had the same idea in mind that we do—to make cider with traditional cider apples," Cavalli says. "But the market at the time just wasn't ready." Now it may be. Heath and Cavalli secured enough fruit of heirloom apple varieties last year to launch their own label, Tilted Shed Ciderworks. Last fall, the couple—who are also growing two acres of their own trees—produced about 1,400 bottles of cider. This year, they've quadrupled their volume, pressing two dozen apple varieties for about 1,200 gallons of juice, scheduled for release in the early summer of 2013 after a slow, cold fermentation and several months of aging. Their ciders include Graviva!, a blend of Gravenstein and several heirloom varieties, and January Barbecue, made with additions of smoked apples. 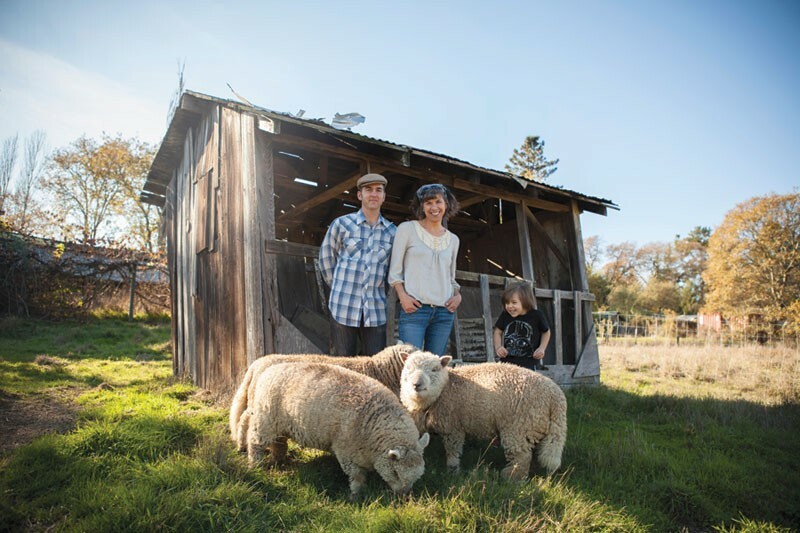 Other local entrepreneurs prospecting in the frontier of hard cider include the Philo Apple Farm, the AppleGarden Farm in Tomales (featured in the April 25 issue of the Bohemian), Apple Sauced Cider and Boonville Cider House. In southeast Petaluma, Murray's Cyder is also growing. The company was first founded in 1998, then floundered until a man named Wayne Van Loon bought and rebooted it several years ago. Van Loon released his first ciders under the label in 2010 and has since doubled the volume, with 6,000 hand-corked bottles of the 2012 crop soon to appear at local retailers. The ciders, made in the style of Normandy, are dry, tart, complex and not so "easy" to drink as they may be intriguing. Van Loon has high hopes for the future. "The cider market right now is exploding," Van Loon says. "People were overjoyed once with a can of cold lager. Then someone handed them a bottle of Anchor Steam, and craft beer has seen rising sales almost every year since." Cider could follow a similar upward trajectory. In just the past year, American apple cider sales jumped by 65 percent, and the rate has increased for several years. For hopefuls in the local craft cider community, however, there is one severe limiting factor on what the future may offer: the local apple supply. The short story is that there's not enough fruit—that is, not enough fruit of the right sorts. Compared to familiar eating apples, cider-specific varieties are fraught with tannins and acids that make some of them too tart or astringent to eat but which bolster a finished cider with backbone, aroma and complexity. It was the desire for heirloom cider apples that sent Heath and Cavalli bushwhacking into the riverside undergrowth last year to find their "Lost Orchard," as they now call the grove of two dozen trees. And it's the same need of such fruit that has inspired several other small local farms to graft cider apples onto their existing trees. Now varieties like Kingston Black, Nehou, Muscat de Bernay, Tremlett's Bitter, Frequin Rouge, Roxbury Russet, Porter's Perfection and dozens of others are available in limited quantity in the North Bay's apple orchards. Apple acreage in Sonoma County has been declining for decades as farmers sell their land to developers or, just as often, grape growers. But veteran apple farmer Stan Devoto is venturing in quite the opposite direction—he's allotted about a fourth of his small Sebastopol farm to heirloom apples, including many cultivars traditionally reserved for cider making. Devoto says the best money in the local apple industry comes from selling fresh fruit, but he plans to market his blemished "number twos" to hard-cider makers. First in line for the fruit is Apple Sauced Cider, which Devoto's daughter Jolie Devoto Wade owns with her husband, Hunter Wade. Along with their hired cider maker Rick Davis, the Wades released 1,200 cases of pure Gravenstein cider this year. They plan to release a larger volume next year, including blends using Devoto's rare varieties for added layers of complexity and character. Hunter Wade says he "fell in love with cider" while traveling in northern Spain. The traditional cider of the region is made using blends of local apples and is bottled as a tart and musky beverage almost void of carbonation, a style that Wade believes might not find success this side of the Atlantic. "I don't think the American palate is ready for Spanish-style cider," Wade says. Not that cider is new anything to America. A 2009 article in Slate Magazine reported that in Massachusetts in 1767 the average per capita cider consumption was 35 gallons. Westbound pioneers brought the apple with them, making the fruit a ubiquitous addition to homesteads across the Midwest. The storied labors of Johnny Appleseed also maintained diversity and availability in America's growing apple culture. But mysteriously, cider all but vanished in the late 1800s. Americans would never stop eating the fruit, but we essentially quit drinking the fermented juice of the apple. Now the local cider culture is planting new roots. Sebastopol's Ace Cider, for one, burst from a tiny craft house in 1994 into one of the largest cider companies in America. Ace relied on Sonoma County apples for at least a decade before it outgrew local supply and turned, increasingly, to imported juice concentrate, much of it from overseas. Growth may be easy for Ace and other such giants that utilize low-cost imported juice. But for "the 707 cider crew," as insiders call the local craft companies, the future will be an uphill crawl as they seek out the fruit they need, whether by contracting with existing apple farmers or by prowling through abandoned properties. "We've tapped out our local growers, and the challenge is going to be getting those [bitter apples], which are like the holy grail for making the cider style we like," Cavalli says. Van Loon expects the craft cider industry to boom, and soon, whether he's ready or not. "The fact that MillerCoors bought Crispin last year means they've taken a stake in the future, too," he says. "I have no doubt that the cider market will explode. I just need the right trees, and I can't grow them myself in a planter box." Look for locally made ciders at Shelton's Market in Healdsburg, Andy's Market in Sebastopol, both locations of Berkeley Bowl, Paradise Foods in Novato, Petaluma Market, and Upcider in San Francisco.